2. Use a little of the margarine to grease a deep ovenproof dish approx. 8 inch diameter. 3. Peel, core and thinly slice the apples. 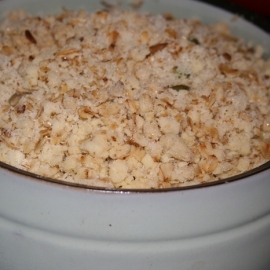 Cover with water until ready to transfer to the dish (just before adding the prepared crumble mix). When ready, lift the apple slices out of the water and transfer quickly to the base of the dish without shaking off all the water. 4. Seive the gluten free flour and lightly rub in the margarine. You will be left with lots of small clumps of flour and margarine - this is how it should be. 5. Pick any large pieces of dates and raisins from the muesli and sprinkle onto the apples with half the sugar. 6. Add rest of sugar to crumble together with the muesli. Mix all together then spoon on top of apples without pressing it down. 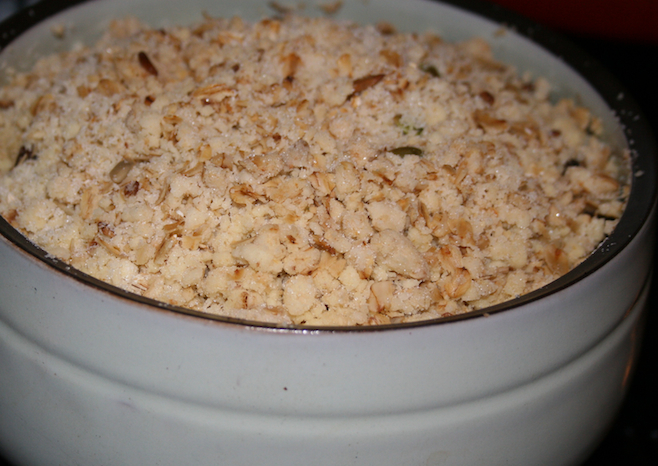 It is fine to pile it high above the level of the rim of the dish because as the apples cook and reduce in size, the crumble mix will subside also. 7. Cook for 40 - 45 mins until golden (check every 5 minutes after 30 minutes). If you like the apples very soft, turn the heat down and leave for an extra 10 minutes. 8. Serve hot with a dairy free / gluten free ice cream or non-dairy milk custard. I like my crumble piping hot from the oven served with chilled custard. Delicious.